While the optimum adaptation to the night vision can take up to half an hour. 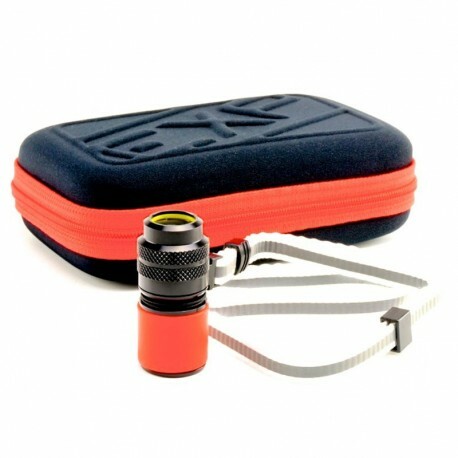 The mini flashlight Exposure Navy XS-R emits a red light that preserves night vision. Because the eye is less sensitive to wavelengths emitted by the red light. Few also be used as a headlamp with his headband sold in the accessories. Thanks to its light weight of 20g and its miniature design, the XS-R mini lamp torch can be worn around the neck freely and has the advantage of being easily accessible. The color silicone band and its adherent material distinguish the torch in the dark and allows you to hold the mini lamp "bite" the silicone band in order to have both hands available to make a splice for example. The activation of the mini XS-R lamp is made by a simple rotation (horraire direction) of the head of the lamp. For marine middle in use, the XS-R meets IP67. Rechargeable batteries and charger are available as accessories. The lamp has two levels of light intensity, fashion STRONG or WEAK. The Night Vision Optimized Mode (ONV): optimization of night vision mode allows the red light to preserve night vision. The optimal adaptation to night vision can take up to half an hour. The eye is less sensitive to wavelengths emitted by the red light. Learn more about optimizing night vision.